En av våra bäst säljande toppar någonsin! 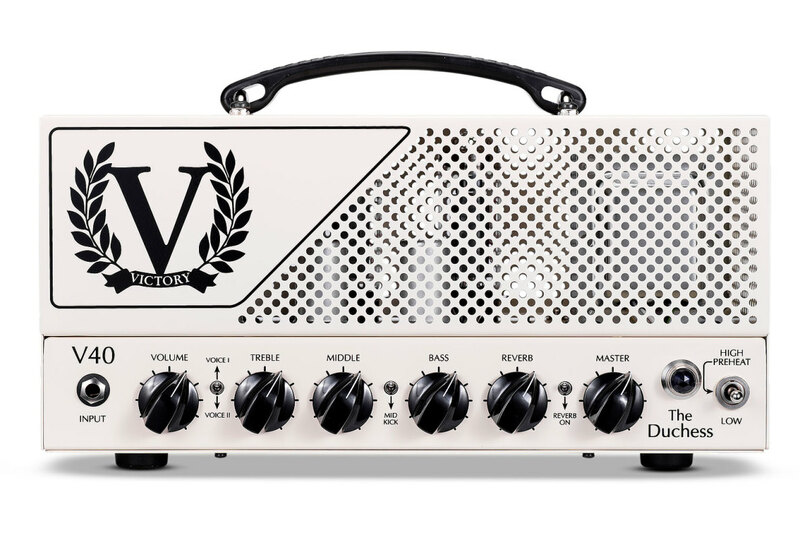 The Victory V40 The Duchess is a cool little 40w handmade head that brings the handiness of lunch box style amplifiers to a whole new range of guitar players. Although everyone and their mum now has a small lightweight head of their own no one has really every made one focused on the clean side. I mean a lot of them had clean channels but they were never the key focus. With the V40 they have changed that and made a single channel head that can take you from clean to mild overdrive without having to lug a 20kg combo. Just match this up with its highly portable 1x12 Celestion Creamback loaded cab and you are ready to get on the road. With a single channel this amplifier is able to focus on just a couple of key sounds. You have two different voicings available in the V40. One which has a 60's warm American feel while the other is a bit more 50's sounding. It may not sound like a huge difference on paper but in the amp these subtle changes can make a big difference to your tone. 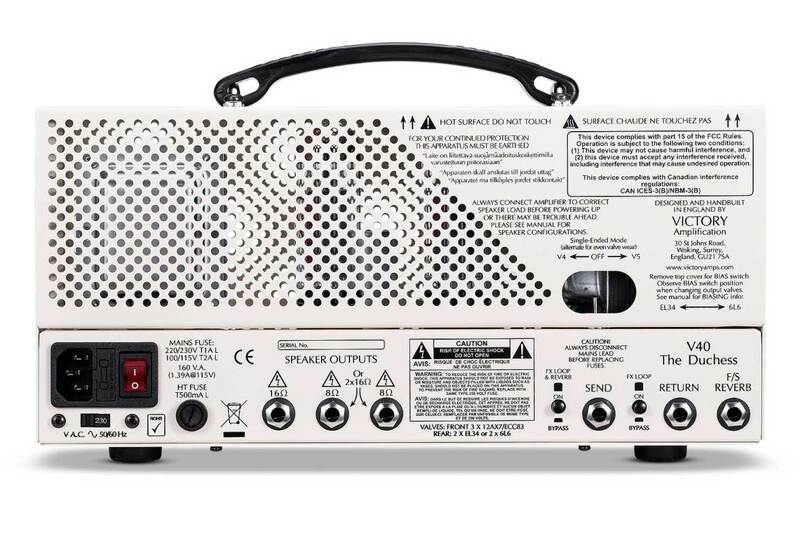 With 40w of power you do not need to worry about your amp breaking up before you get to gigging volume. It does not end at just being a phenomenal amp though. Victory have added in some amazing little touches and features that make this amp perfect in a wide range of situations. To start off this amp has a beautiful subtle foot switchable reverb built in that is great for adding a light ambiance to your sound. Probably the most important feature is the variable power stage so you can get output levels between 9w and 40w so even at home you can still use the same amp as you do on stage. For those that prefer 6L6 valves over EL34 you are in luck. The V40 can work with either EL34 or 6L6 tubes so no matter what your personal preference for tone is the V40 can handle it. As we said this amp has just a single channel but in todays world of beautiful high end pedals that only get better year after year you really don't need anything else. You just need to set this amp up with your base sound of choice whether that is clean or dirty is your choice and then pile on the pedals. One of the main things Victory wanted this amp to be able to do was respond well to pretty much any pedal on the market. I would say that they have got it pretty much perfect in terms of its responsiveness to pedals. "The V40 has effectively carved out its own niche, and looks set to become popular for blues, roots, jazz and country players." "What never fails to impress us is the way each instruments character is faithfully reproduced." "The V40 is a serious piece of work, built to a high standard and just as ready for non-stop professional touring as it is for your bedroom or study."